Blog Post 11 – A Contest! I loosely alluded to this in a previous post, but we’ve decided that we want your weather lore! We’re putting together a show based on weather magic and folklore, and we need good field reports. So, we’re having a little contest here at New World Witchery. From now until the end of February 2010 (the 28th), anyone who: 1) posts a comment on Blog Post 10 – Weather Work, or 2) sends us an email describing any kind of weather-related magic or lore, especially family or local lore, will have their name entered into a drawing. Also include what part of the country/continent you’re from (you don’t need to give us specific locations, unless you win, of course…then we’ll need an address to ship to 🙂 ). All entries must be date-stamped before midnight CST on the 28th to be considered. And if you’ve already posted a comment with weather lore, don’t worry, we’ll count you, too! 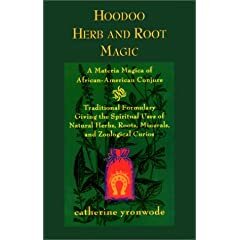 On March 1st (or thereabouts), we’ll be drawing a name from the thousands of entries we receive (we’re optimistic) and one lucky reader/listener will receive a free copy of Catherine Yronwode’s Hoodoo Root & Herb Magic. For those of you unfamiliar with this text, it’s the quintessential text on the botanicals and curios used in the practice of Southern-style hoodoo and conjure magic. From the proprietor of the Lucky Mojo Curio Company comes the most thorough, complete, and authentic book on how roots and herbs are used in traditional African-American folk magic. 500 herbs, roots, minerals, and zoological curios are listed, along with their scientific names, so you will know exactly what to harvest or buy from an herb dealer. Included are an amazing 750 spells, formulas, mojo hand combinations, and candle rites, all given in workable, practical detail. Medical usages for many of the herbs, supplementary botanical notes, a series of cross-indexes listing herbs by the magical conditions for which they are recommended, plus 50 beautiful black and white illustrations of herbs and vintage herb packaging round out this informative reference volume. There is no other herb encyclopedia like this one. This is the book to get if you are working traditional conjure and herb magic. 224 pages, trade paperback. 500 herbs, roots, minerals, and rare zoological curios, with taxonomic (“Latin”) names for proper identification. 750 traditional spells, tricks, and magical recipes. 50 black and white line illustrations of common magical herbs and roots of North America. 6 handy charts in which dozens of conditions — such as love-drawing or protection — are listed and the herbs for each condition are given in alphabetical order. Cross-referencing: Every herb is accompanied by at least one spell. Bibliography: Authentic recipes are drawn from first-hand experience and 100 years of solid folkloric research. I own this book and let me assure you, it’s one of the best magical herbals out there. No fluff, no repetitive 101 stuff; just good, solid information backed by great research. So, if you want to contribute to the wealth of knowledge and lore in the witchy world, plus have a chance to get a fantastic magical reference book, please submit! We’ll also be announcing this on the next podcast, too, so if you primarily keep up with us that way, you won’t be left out. This entry was posted on February 5, 2010 at 8:54 am and is filed under General Information. You can subscribe via RSS 2.0 feed to this post's comments. Hi guys! I noticed you haven’t gotten any responses yet. And since I am teaching a class involving Nature Magick and have been compiling such lore myself or it, I thought I’d share. First a few pieces of farmer’s weather lore that I have found are completely bunk, as in, untrue. Cats scratch a post before a wind, wash their faces before a rain, and sit with their back toward the fire before a snow. ~ As any cat owner will tell you, cats do all of these things often many times a day with no correlation to the weather. However you still will find this little piece of “superstition” in the odd book and on websites. If a rooster crows at night, there will be rain by morning. ~ This has more to do with a rooster trying to get laid, trying to scare off a fox or other predator or having a territory dispute with another rooster in a pen nearby. When dogs eat grass, you can expect a severe storm. ~ Dogs eat grass for nutrition and because it help with digestion. They will eat grass whether a storm is coming or not. Birds on a telephone wire predict the coming of rain. ~ Or it simply means the flock is taking a break and hanging out. Seeing them all take off and go hunker down in a bit of shrubbery is a better indicator. If bears and horses get thick coats early, then expect a severe winter. ~ This seems to be actually true. Pigs gather leaves and straw before a storm. ~ Indeed often they do. If a dog starts to whine for no reason, you can expect a major storm. ~ I suppose this depends on the dog, some dogs seem to know when storm are coming and other do not. We do know that dogs sense earthquakes before we do and will take off running looking for cover. Of course the best way to predict the weather is by getting to know your landscape and the sky above your head. For example some species of trees will turn their leaves, exposing the underside before a rain, if you keep an eye open you can learn to recognise these kinds of signs. Now someone else make a comment or I’ll whack you with my big stick!